Have you ever wanted to uninstall or remove the DEFAULT applications from your Android mobile phone? Then we will guide you in the same so that you can remove the unwanted and un necessary default applications. There are many such applications which are actually not worth of having them on our mobile phone. For people who don’t prefer to open the eBook reader, it is actually not worth keeping this app in their device and if anytime you wish to read the eBook then you can easily install the same eBook reader again from Android Market place. Many of us flash our mobile phones with third party operating system which is nothing but called as a ROM. But do you know that you can create your own custom ROM very easily. So, let’s take advantage of Open source of Google Android platform which will help you to uninstall or remove the applications which are present in the device by default. Before we proceed you need to make sure that you have resources like Windows XP SP3 or even Home edition will do, Java Run Time Environment JRE Pack, WinRAR or WinZip and an obvious Android phone with you. There is no need to back up your data as in this procedure there is no fear of losing any data. Also, this is not something wherein you will be required to root or any other thing like that, so the procedure can be followed easily. First of all you need to download any of your favorite custom ROM in your computer. Next up after downloading the custom ROM, you will need to download the Auto sign in your computer. After downloading, you need to copy the ROM.zip file in the Auto Sign folder and rename the entire folder as update.zip. Now, after doing this you need to open the ROM.zip by double clicking on the ROM.zip, Please note that you need not unzip the folder, just you need to open it. Now, after opening the folder, you can see that there will be lot of applications. 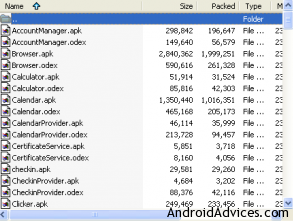 For every application you will see that there are two files, one with extension of .apk and other with an extension .odex. If you want to delete say browser then you need to delete both apk and odex both of this corresponding file. You can use WinRAR for deleting these files. As soon as the applications are removed, now you need to sign into your ROM by double clicking on it and need to run Sign.bat. Please make sure that the update.zip folder is in the same folder of Sign.bat. 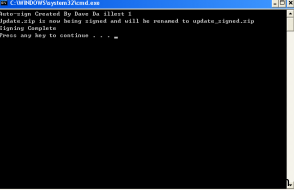 So, as soon as you complete this process a file called update_signed.zip gets created after which you can flash your mobile phone with the customized ROM. Please ensure that the files deleted by you are the files which are not required by you. As if you are deleting an application and then to get that back you again need to flash with the original firmware of the device which will be again time consuming,in some cases you can find the equivalent applications in the Android Market place. If you encounter with any problems then do lets us know about this. Also, this technique was successfully tested in Samsung Galaxy S smart phone and is not tested in any other phones. 1) I have a macbook pro. Can I do the same thing using my MAC? If so how do I do that? 2) I have a Galaxy S II. Will this work on the S II? and is it possible to revert to the regular gingerbread or ICS OS afterwards and still not have the default apps? yes you can install KIES for MAC and wait for the official update to arrive! @Shalabh, I tried looking for the default app manager but could not find it. which phone you are using? but have you tried re applying the update!? thanx for in advance for any body reply…. kindly root the phone again as its not rooted! What zip file are we talking over here. I have upgraded to 2.3.4 XXJVP. Where do I get the zip file? Also, do I need to do a factory reset to update this ROM. After the gingerbread upgrade using Kies I want to have live wallpapers back & also the email changed because some silly reason you cant choose in general settings to only download headers as in the froyo email version. Can I use any firmware for this like i9000 XXJVO? When I click on that zipfile I only see the CSC, PDA & PHONE tar files? No, its a phone specific update, which Android phone u are using!? A good tutorial. Erasing the Google default account in Android was what I had needed since long, and this one worked. Why do App downloads in Android fail? how to fix it?